At some point of every season there are the inevitable discussions over which major European league is considered the best although what the best actually comprises is seldom accurately defined. In recent times, the argument has centered around the Bundesliga, La Liga and Premiership and is often inextricably linked to the performance of teams in the Champions League even if this offers no clear assessment of the depth of quality within a league as a whole. The Bundesliga appears to be a recent discovery for many and so some plaudits are thrown in the direction of Germany before the debate moves forward. Spain’s La Liga is the most technical, they claim, but the game is too slow, it revolves around a tiki-taka style of play and lacks excitement. Observers, either ignoring or completely oblivious to their own bias, will thereafter state that the Premiership provides the greatest entertainment which therefore makes it the best. Perhaps those who would attack La Liga as being boring or too tactical should have been at the Riazor last night and witnessed a superb encounter between two teams fighting to secure their future in the top league, and in the case of Depor, possibly their future existence. Two teams who simply went at each other for the full duration of the game with neither overly concerned about shape or discipline as the game progressed, just about getting goals and securing at least a point but always with an intention to construct play from the back in a positive fashion. The one interesting point was the use of Bruno Gama on the left and Pizzi on the right. Otherwise, it was fairly expected line ups from both sides. 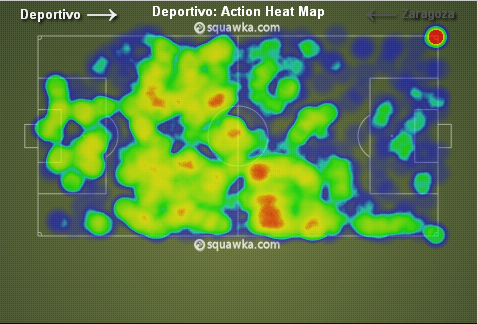 Deportivo’s attacking intentions were clear from the outset. They were going to attack down their right hand side. In the opening 6 minutes, three attacks all came down the right side with Roberto saving well from Riki’s shot during these early exchanges. The reason for the reliance upon the right was the deployment of Pizzi here rather than Bruno Gama as normal. Pizzi would cut inward onto his stronger left foot whilst Rikki drifts outwards to the right. Their combination play coupled with the prompting of Valeron gave Deportivo a strength on this side that Zaragoza never really came to grips with or managed to quell. The opening goal in the 10th minute began when Pizzi robbed Romaric deep in the Depor half. Depor broke on the right before cutting infield with Valeron providing a perfectly weighted pass for the onrushing Bruno Gama, cutting in from the left, to fire beyond Roberto. The second Depor goal, and the equaliser, resulted following Abraham conceding a cheap free kick wide on the right. The delivery was good but Zaragoza partially cleared the ball only for Aguilar to head the ball back towards the goal and Marchena scored with a low strike. Zaragoza tried to push out too quickly and failed to mark players moving back into the penalty area. They had received an earlier warning when an excellent Depor set piece in the 22nd minute saw a header back across goal before the unmarked Aguilar scooped the ball over. If you were being hyper critical, the finger of blame could be pointed at Romatic who was closest to Marchena and did nothing. Zaragoza were too intent on playing a crude offside trap. The warning was not heeded and Aguilar was able to help Depor take advantage. The graphic above provides further evidence of the strength of Depor on the right. With the second most touches in the game (75) behind Manuel Pablo (77), Aguilar had a calming influence on Depor yet was able to repeatedly unnerve Zaragoza most notably at set pieces though not through delivery. Aguilar won a number of headers including one that set up Marchena for the equaliser. In the second half, his aerial presence set up Aythami who failed to score but moments later his presence unsettled the Zaragoza backline at a corner and the ball ricocheted off the unfortunate Abraham for an own goal. This would turn out to be the winning goal. Defensively, Zaragoza failed to adequately deal with Deportivo particularly at set pieces when they seemed incapable of marking properly or clearing their lines adequately. The game was a personal nightmare for Abraham at left back. Aside from Deportivo relentlessly attacking his area, the full back conceded the free kick which led to the opening goal, scored the own goal which turned out to be the winning goal and, finally, was sent off for a second caution late in the game. 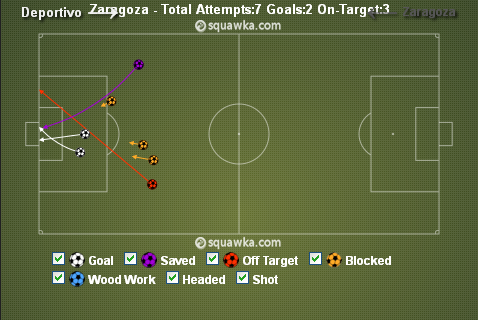 Yet if Zaragoza failed to impress defensively, in attack they were just as limited despite scoring two goals. 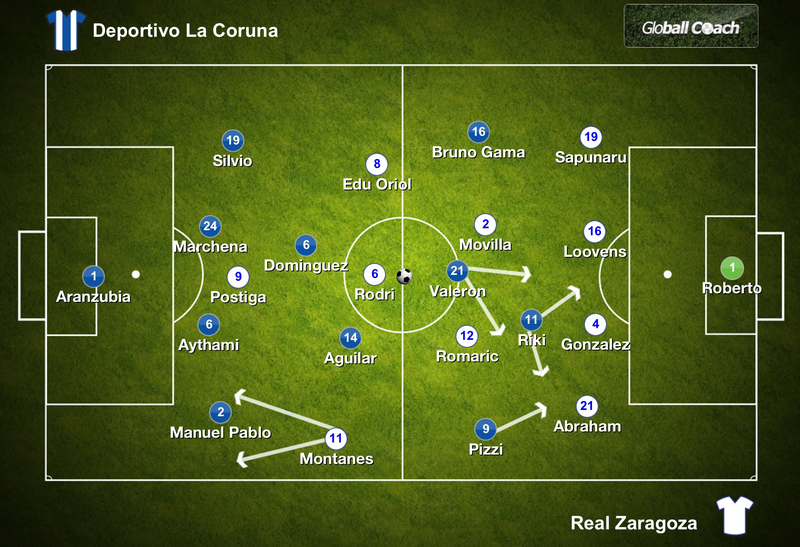 Both of the Zaragoza goals arose from defensive mistakes from Depor. Postiga scored Zaragoza’s first goal from the penalty spot after Aythami inexplicably handled the ball in the area. Although the Portuguese striker was behind Aythami, it would still have required a tremendous effort to score. As it was, Postiga was presented with a much easier opportunity to level the scoring. Zaragoza failed to take full advantage of Montanes pace against the veteran Manuel Pablo even if the young winger robbing the full back earned Zaragoza’s second goal. Manuel Pablo was dispossessed at the halfway line and the Depor backline was spread across the pitch as they were building play. Postiga and Movilla combined to release Montanes who easily outstripped the Depor defence and flicked the ball beyond Aranzubia to give Zaragoza the lead. This was the problem for Zaragoza. When they had possession, they had no cutting edge. Just 26 league goals in 29 league games before this meeting outlines the problem. Zaragoza would have decent possession and look to build attacks although they were a little more direct than Depor but they simply had nothing within the final third. Montanes looked lively but beyond that, there is not enough quality. Can Lighting Strike Twice for Jimenez? Manolo Jimenez somehow managed to drag Real Zaragoza from the relegation mire last season when it seemed inevitable that they would be relegated. Nine wins in their final 14 league games completed a remarkable turnaround in fortunes which continued into the early part of this season. At the mid-way point of the season, Zaragoza sat in 13th position but the rot had already set in. And now it shows no sign of stopping. Forget about Barcelona at home next week, the real test for Jimenez and Zaragoza arrives in the following weeks when they face Celta Vigo and Mallorca back to back. These are the games which could define their season. No discussion of a Deportivo game would be complete without at least a passing mention of Juan Carlos Valeron. As the veteran midfielder enjoys one final hurrah in La Liga, he still possesses the class and ability to glide effortlessly around the pitch in slow motion amidst the whirling maelstrom that surrounds him. Valeron still plays with a style and swagger that few can offer. His pass provided the assist for the opening goal, a lovely weighted pass that ran straight into Bruno Gama’s path. In total, Valeron completed 45 of his 60 attempted passes and although he did become less of an influence as the game progressed and became more open and stretched, if Depor do pull off the great escape, it’s certain to involve him along the way. With the final goal being scored in the 55th minute, both teams still pushed forward. Zaragoza to grab the equaliser for a second time in the game and maintain a gap of 4 points over Depor. For the Galicians, another goal was needed to overturn Zaragoza’s advantage in the head to head record. It made for a thrilling ending to a superb game and demonstrates the quality that exists at both ends of the La Liga table. Unfortunately, financial mismanagement over a prolonged period is now severely curtailing the ability of clubs such as these to progress beyond a hand to mouth existence. But on nights like these, the quality remains on viewing for all to see. In terms of this game however, Depor may very well come to rue the missed chances at the end of the season. Real Zaragoza are in trouble and Jimenez must be feeling the strain. With just five draws and eight defeats from the past 13 league games, Zaragoza represent that team which the media love so much when they talk of a relegation fight. The team that nobody expects to become involved in the relegation struggle but that somehow gets dragged into it. Perhaps there is a degree of truth given their present run of form but what is also undeniably correct is that Zaragoza don’t have a lot of quality within their squad. And early season form helped flatter to deceive. The Great Escape from relegation remains a distinct possibility for Deportivo La Coruna. After 10 weeks in the bottom spot, three wins on the bounce have given Depor a sense of hope. From his seven league games in charge, Fernando Vasquez has secured 10 points. And the men from Galicia now have the opportunity to remain in the top flight. The job is not yet over but they have successfully completed part one and ensured that there will be a part two.